A few months back I tried to sign into an old Twitter account so I could close it down (since it's linked to my old business, which is closed down). After a few failed entry attempts, I resorted to "Forgot your password?" It's usually a quick fix, right? Supply the website or application with a username or email address to trigger an automated response with your forgotten password, or a temporary one for immediate update. "Sorry, we're unable to send a password reset to that email address. 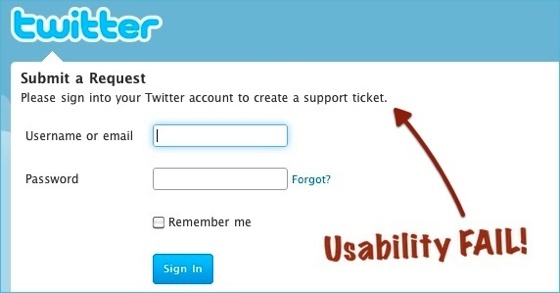 You can request a new password by entering your Twitter username, or file a support ticket if you'd like further assistance." Why of course, by signing into your account! After a breather, I dived into the support / FAQ pages to look for a different way to get Twitter help. Noting that 40-50 seconds is the max. that most people would give this task I pushed on. Also interesting to note is, when I stopped to think about why I wasn't giving up, it was because Twitter is so massively successful. How could they possibly overlook something like this? It must be fault, I'm not looking for the answer in the right way/the right place. I did finally come across a general-use contact form. It didn't help either, but before I explain why I will say it was a well designed auto-response email. Unlike the usual copy-and-paste of everything you've already read in the user support section (hello LinkedIn) they did suggest some scenarios I might have been overlooking. I wasn't overlooking any of them, but they were still good troubleshooting suggestions. They also get points for offering the option to reply to the email address your support ticket response has come from. As opposed to having to copy your correspondence thread and support ticket ID, etc, etc, into a fresh contact form. Despite the positives, the "exact detail of my problem" is that the email address I registered with is no longer accessible to me. It's not Twitter's fault. Getting locked out of online accounts because you've lost access to obsolete email addresses happens all the time. So why do so few online services (and even some software providers I've noticed) account for this?